This post was written for inclusion in the monthly Authentic” Parenting Blog Carnival hosted by Authentic” Parenting and Living” Peacefully with Children. This month our participants have written about authenticity through self-expression. We hope you enjoy this month’s posts and consider joining us next month when we share about Peaceful Parenting Applied. Being a homeschooling Mom is difficult – especially when you have a slightly challenging child. He’s not bad by any means. He’s a very sweet boy with a very very very good heart. He is a little attention challenged – I would say. I don’t admit this often, and I would never tell him because I don’t want him to feel that he is different or bad or challenging. It has gotten a lot better. He is a champ – and with us just working with it – he has improved greatly. I noticed he had some challenges when I first started homeschooling him in Kindergarten. I didn’t talk to the pediatrician. I didn’t want him to undergo unnecessary and exhausting testing. I didn’t want to medicate him. I wanted to figure out how we could work through it together. It’s been a learning experience that has required a lot of patience on both of our parts, but it certainly has been exciting to see him blossom into a beautiful young man. However, there have been times…let me tell you. I have made many mistakes. I have learned, grown and want to share with you some of the things that have worked for me in getting him interested and loving school, involved with his education, and confident in himself and his abilities. Praise. I give him constant praise for everything – even if he comes up with the wrong answer. I stay positive, we work through the process, to see where he has made his mistake, and then I praise him for trying. I tell him that we don’t always get things 100% right, but if we know the process, 9/10 times, we will come up with the correct answer. The process is what’s important. I also tell him that I am very proud that he tried so hard, concentrated so hard and worked so hard (which is very true). I hug him and kiss him and make him feel loved and supported. It’s important that everything is true and comes from the heart. Being tuned into your own children – and allowing yourself to be taught when necessary. My kids teach me all the time. An example – My son will often get into moods where he will look glassed eyed – off into never -never land. When you look at him, it seems as if he’s not listening – and totally tuning you out. It’s quite frustrating. Well, he is listening – he was getting it. This was an important lesson that I had to learn. It’s part of his personality. Finding a curriculum that works. This isn’t really an option if your child goes to public or private school . I found curriculum that presents the same topic 3 or 4 times – sometimes in different ways. If he doesn’t get it the first time around, there are ample opportunities – as it will come around again. It helps him and me. Him – it builds confidence. Me- it helps me to calm down and know that just because he’s not understanding right here and now, that it’s coming around again. Eventually, he will get it. Always by the end he understands the concept (when presented alone). Stepping back and taking a break. When things get too frustrating, sometimes you just need to take break – and go outside for some air, or go to the park, or end the school day. Negativity will impede the learning process. These are just 5 tools that have helped me to not only teach my kids in a positive and productive manner. It helps to keep a safe space for everyone to prosper and grow. I would love to hear your ideas. What tools have you employed to keep things safe between you and your children? 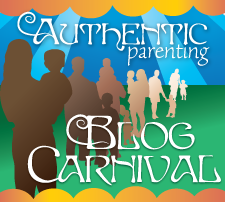 Visit Living” Peacefully with Children and Authentic” Parenting to find out how you can participate in next month’s Authentic” Parenting Blog Carnival, when we discuss self-love! Dealing with Whining Compassionately – Mandy at Living” Peacefully with Children discusses ways to deal with whining when it is getting on your nerves. Laura from Authentic Parenting wonders how to resist being swept away from the storm of emotions in a sensitive child. How a peaceful parent speaks -Will the truth set you free? Shonnie at Heart-Led Parenting tells how being truthful (and more) in the way she talks to and about her daughter has helped create more peace and joy in her home. Do you have blog posts about peaceful parenting or are you looking for some tips? This month, Authentic Parenting and Living Peacefully with Children are hosting an Authentic Parenting: Peaceful Parenting Applied link” up! Check it out and help build a resource for parents striving to parent more peacefully. While we have different parenting methods (our family doesn’t use rewards or punishments), I can tell how much you love your son through your post. You are so right that we can learn so much from our children, and taking a break or changing things so that you have something which is working for everyone are important to our day to day life. Thanks so much for your post. I love this carnival. I am enjoying everybody’s post so much. I am learning a lot. I have actually never heard of parenting with no consequences what-so-ever. I just try to do everything so that they understand what they have done wrong. Well, it hasn’t always worked, and my husband gives me grief. We don’t do rewards. I tried, but it didn’t work. All they wanted was bigger and more expensive rewards. I feel like I sort of go with the flow, and try to see what works. I will get those two books and do some reading! You are very right Laura. It’s about getting myself together. So very true. You spoke a mouthful! I like that “keep things safe between you and your children”. I find what helps me is to pick my battles and offer choices. I want my daughter to have as much agency as she can. And I find that the freer she feels, the more she listens to me when I really need her to. Picking your battles is so important. It’s so wasteful to talk through stupid and insignificant things. You know, I used to get annoyed when my daughter wanted to change her clothes 15 times during the day. Finally, I said – fine. Go to your room and change your clothes, I don’t care. Change them 100 times – but you need to do the changing. You are so awesome for stopping by! Thanks! It is difficult, but the most rewarding thing I have ever done. I have watched my children blossom into beautiful people right before my eyes – in a non-violent, non-competitive, non-judgmental environment. Thanks so much for stopping by Courtney! I would love to read your article! Thanks so much for sharing! Yeah, there are so many diagnosis of ADD. It’s crazy. I don’t think these kids are ADD at all. I think they are normal kids in a 30+ kid classroom. How could one person handle so many personalities. It’s impossible. So yeah, I totally get it! I’ve found myself wishing that I could homeschool occasionally.. but if there is one thing I’m not – that’s a teacher. Sounds like your boy is doing great. Well, I am sure that’s not true. Mothers teach their children almost every moment of the day. I find motherhood as a constant teacher process. Thanks so much for stopping by! I am looking forward to following the linky Party! I love the tools you use! I especially like that you present the same information in different ways and focus on the process over product. You have some lucky kids! Thanks for your honesty and your commitment to your children and your family, Lisa. We’re not at school-age in our home yet, though get to support our daughter’s learning (and our own) everyday. We do a nightly acknowledgement ritual at dinnertime (along with our gratitude) where we each say one thing that we acknowledge each person for, including ourselves. For us this is a moment to really shine a light on part of each other’s being or doing that we noticed that day — it feels good to share these words and to receive them. I used to be a big praise-giver until I read Unconditional Parenting by Alfie Kohn which you might enjoy. For me it opened my eyes to the ways that my praise might unintentionally take away some of my daughter’s own joy in her experience and also how it might be limiting her ability to do things for their own sake rather than doing things because mama then says nice things to her. Thank you so much for your insight and comments! You know, I must admit that I really really loved this carnival. The energy is so wonderful – and I have learned sooooooooo much. I have gotten the two books that Mandi recommended, and I will get this one as well! Thank you so much for stopping by! I can’t wait to read the posts in the link-up.